Water Conditions: Clear and cool. This weekend Vita and I celebrated our 10th wedding anniversary; we call our anniversary weekend our “honeymoon” and each year we spend it someplace different. This year we spent it in our favorite place, Mammoth Lakes. During most years- I don’t, won’t, can’t fish during our honeymoon due to the looming prospect of physical injury. This year was different. Vita’s sister invited herself along at the last minute, which gave me the perfect opportunity to get out. Vita and I would spend Saturday together and then she and her sister would spend the day Sunday shopping. Perfect. 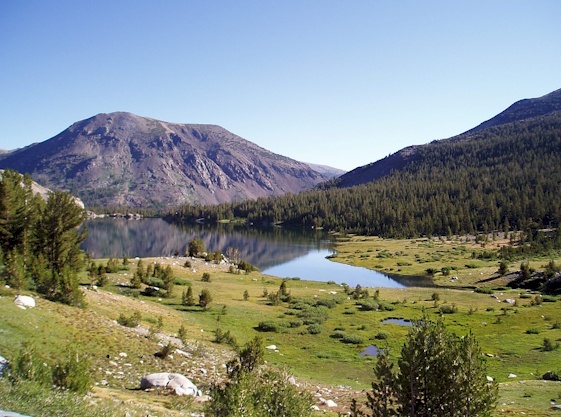 In the east sierra guide book that I picked up over memorial day, there weren’t may streams listed that were new to me. In fact, all but two of the streams I’d either fished or scouted. Today would give me the perfect opportunity to fish one of those two- Glacier Creek. 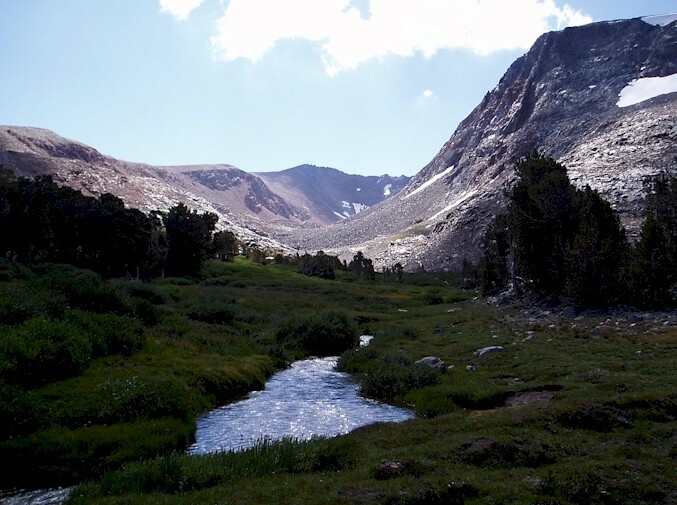 Glacier Creek is a very steep stream that feeds a lake north of Mammoth. The description in the guide book intrigued me so I thought I’d give it a shot. My plan was to fish the inlet at the lake for a time and then hike up the stream a bit before fishing. I parked my car above the lake and made my way to the far side. There was already another fly fisher there when I arrived. He was wading about 20ft off shore and hooked into a small fish just as I approached. I asked him how the fishing was and he told me that I had witnessed his first fish in an hour. I found this hard to believe because there were rising fish all over the lake. Presumably these fish were rising all day because they were still rising when I returned and a well placed fly was readily accepted by them. I took the fly fisher at his word and walked up the stream looking for the trail. It was fairly steep with lots of loose gravel, not exceedingly difficult but I had to laugh when each individual in the group of rock climbers ahead of me, nearly fell flat on their face as they hiked over the loose terrain. We were basically hiking together, with me taking up the rear. I made idyll conversation until they decided to look for less treacherous terrain. It’s was a pretty ironic scene. Four young, fit rock climbers slipping and sliding on terrain which, presumably, was mild compared to where they were headed and me- overweight, pushing 40 fishermen making his way up the trail as easy as you please. The climbers where hiking faster than me and were soon far enough up the trail that I could not see or hear them. I hiked slowly, not wanting to tax myself, checking out the stream as I went. It was a typical plunge pool stream, fast and steep, and would be inviting except for the fact that it was still a little too high to fish. This year's heavy rains mean that most of the high country streams should fish well until the end of the season. I didn’t really have an idea how far I’d hike. I figured I’d hike about an hour and fish wherever I was. I caught up with the climbers in the first meadow. They appeared to be taking a break. During the hike I was seeing better and better water and now that I was in a meadow, my will power had failed me. I still had another 30 min to hike but I decided to take 10 min. and wet a line. In the meadow, the stream ranged from about 10 feet across at its widest point to about 3 feet, with steep banks and a bed of golden stones. The stream stones were very reminiscent of the Golden Trout wilderness and for a moment I entertained the thought that perhaps I had found a hidden Golden Trout stream. Fishing the stream was a tough proposition. The lay of the land and the shoreline shrubbery made it difficult to get a good drift. In addition, the fish were very wary and insisted on a long, long, long and drag free drift. Of course, I wouldn’t find this out until later. I didn’t catch any fish in the meadow, despite the 3 flies I lost, so I continued on. Imagine for a minute a plunge pool stream. Now imagine that stream 500 meters wide and filled in with grass and you get an idea how the stream is laid out. Each meadow stair stepped the next, presumably all the way into the high country canyon the climbers were headed to. 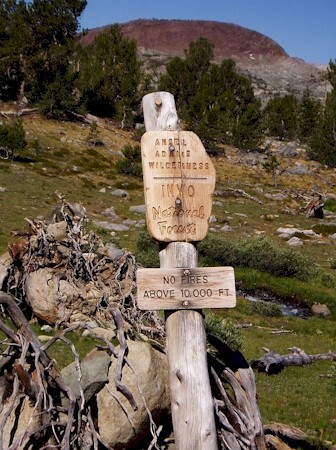 The first meadow marked the boundary of the Ansel Adams wilderness, a place I had not traveled until now. I climbed the steep rocky wall to the next meadow. Here is where I decided to fish. I wasn’t yet at my 1 hour mark but I was close enough and it looked like the trail moved away from the stream. 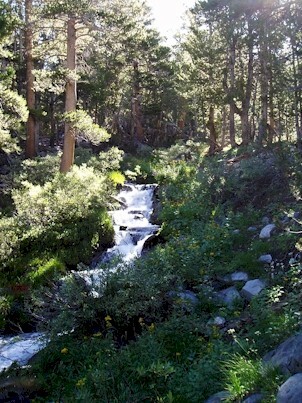 I could bushwhack upstream if I had time but with Vita and her sister in Mammoth, I had to get back to the car by 2pm. As it was, I only had a few hours to fish. The second meadow was very much like the first, except it had more riffles. This was the key as it seemed I could only catch fish in the riffles. I don’t remember all the insects that were flying about but I must have seen some caddis because I eventually put on an Elk Hair Caddis. The stream was partially spring feed, so I presumed it had a fairly good biomass and the fish wouldn’t be particularly opportunistic. 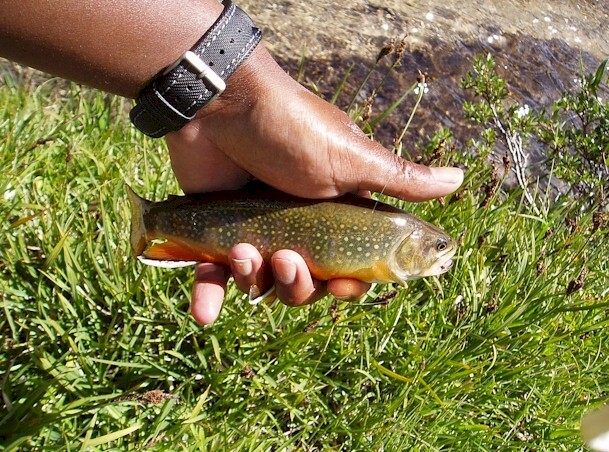 Not particularly opportunistic is one thing but what I experienced from these Brook Trout was ….. I simply don’t have the words. Fishing this stream required belly crawling, 20ft casts 10 feet of the bank and drifts of nearly 30ft! And these are Brook Trout! It took me a while to figure how to fish the stream. I hooked a fish early with a fluke, absolutely perfect dead drift of my dry fly. I knew I had to think hard about this first fish if I was going to catch more. I had drifted the fly through the same run several times with not even a flash. Not all the drifts were great but several were pretty good and should have garnered a little interest from the peanut gallery of small fish. I hit the perfect, under rock, smooth water holding lie with no success. I sat back on the bank a second to consider. The fish was in the tail of a riffle. The riffle was in a wider part of the stream and in the sun. (The stream as it turned out was very cold and this would have been one of the warmer spots.) My drift was dead on- I could never duplicate it with a thousand casts dead on. And I was behind a bush hidden from view. So I had a plan. Fish the riffles, stay out of sight, get the good drift. Now, someone somewhere is reading this and thinking “DUH” but you don’t always have to really consider what you’re doing in fly fishing or on a high country stream in particular. This was Henry’s fork, sit on the bank for an hour and watch, type of consideration. As hard as that is to believe. I made my way upstream, fishing all the riffles, staying our of site and getting what I thought were good drifts. Nothing. I fished my way almost to the top of the fishable water in the valley and took another break. I sat chewing on my oatmeal raisin powerbar staring at the riffle I had just unsuccessfully fished. The riffle was on a small S- bend about with about 15 feet between the entering curve and the exiting curve. I knew my problem had to be my drift. The I realized the problem was with my leader. Either I didn’t have the skill to get a good drift with my 7 1/2 foot 6x leader, very possible, or the leader was spooking the fish. Either way, a downstream presentation would solve both problems. I sat at the top of the S – Bend about 5 feet off the bank studying the currents and micro currents. Kneeling just enough to peer over the bank to watch my fly. I cast my fly over the stream, aiming the cast at a high angle, reached to the right and dropped my rod tip. The line fell on the water in coils. The fly drifted down the riffle and was rounding a slight left hand bend when there was a quick splash. Not a take, but a refusal. I quickly lifted the line and made another cast….Fish on! I maneuvered the fish down the inside of the riffle and quickly released it. Any larger fish, larger than say 9inches, sitting in the pool behind the riffle would have definitely been spooked but I had no other place to land the fish. I made several more casts to the riffle and when I was satisfied I’d picked up the largest fish. I crawled a few feet further down stream so that I could see pool. The cast was the same, this time in the middle of the riffle, allowing the fly to drift freely over the slack water. I missed what was probably the largest fish in the pool and caught several others. When I started to get refusals from fish I hadn’t caught yet, I knew it was time to move on. Down stream there was a similar riffle/ pool scenario, this time the riffle was about 25 feet long before it deepened. I’d fished it before moving up stream and now figured that it probably had fish along it’s entire length. Unlike the previous riffle, this riffle didn’t have any bends or bushes to hide behind. I’d be in clear view the whole time and could only hope that I was kneeling below their window of vision. Presumably I wasn’t. I worked the riffle, systematically letting the fly drift only 15 feet or so at first. When I was convinced that I wasn’t going to catch fish from the upper portion, I let my fly drift the entire length of the run, feeding line as it went. Several times I let the fly drift down and into the pool before I finally induced a rise from a fish in the tail of the riffle. The fish had seen the fly several times but presumably my drift wasn’t good enough. When I was convinced I’d have no more success, I moved on. As I walked down the bank, fish in the middle and head of the riffle darted away. Brook Trout that had refused to take my fly. I made my way back to the first meadow. The water there was quite a bit faster and much narrower. I didn’t want to spend too much time here but couldn't head back to mammoth without checking it out. I was mostly unsuccessful here until I came to a small plunge pool. The water was fast and there wasn’t much slack water. I stood over the pool, staying out of site as best I could while still getting a good drift. I dapped the Elk Hair Caddis into the slack water, the drift was maybe 6 inches. On the second cast a skinny 5 inch fish came up, hovered under the fly a bit and turned way. That was satisfying as I hadn’t even seen a fish in the lower meadow. I headed back down the trail. It was a little early but I’d be able to fish the inlet lake if no one was around. As the stream reached the lake it flattened out a bit and I took advantage of this and drifted my fly through several pools. The takes were confident and sure and my hook sets were right on the money. I hooked half a dozen trout in about 10 min. on the lower stream, 4 fish from the same pool, while standing in clear sight. Something that wouldn’t have happened in the meadows. Stupid fish. When I arrived at the lake, the angler was gone and the fish were still rising. Most were rising off a drop off, just at the edge of casting range. I now understood why the fellow was wading. He’d obviously fished the lake before and knew the fish were sitting near the drop. There were also several fish feeding regularly in the outflow of the stream. These fish wouldn’t take a fly unless is floated down to them as if coming from the stream and turned out to be small brook trout. The fish off the drop appeared to be rainbow trout of about 12 inches judging from the fish I caught and the fish I saw the other fellow catch. The surface of the water dimpled with several fish all over the lake. The pattern seemed random but every once in a while there was an active fish which was taking several close bugs in quick succession. I spotted one of these fish and placed my fly just to her outside. I thought I ‘d miss judged the pattern then I felt a strong tug. The fish fought hard and long and was definitely not a tiny brook trout. I landed a nice hen rainbow. I fished for about a half hour more before hiking back up to the car. I had missed my deadline by now but not by much. I arrived in Mammoth just as the women were checking out of the hotel. We loaded up the car and I we headed back in the direction of my newly fished plunge pool stream. I pointed out the lake and the canyon, which you can see clearly above it, as we passed. We had a long ride through Yosemite into the Central Valley but it had been a great way to spend the weekend.